Ask the Readers: How Do I Get Started with Investing? I've begun to sort through the batch of questions GRS readers submitted a few weeks ago. Surprisingly, many of them are about the basics of investing. But looking at the archives, GRS hasn't covered investing much in the past couple of years; I assumed that the articles in the archives were enough. Maybe it's time to revisit the subject. As an example of the sorts of questions people sent in, here's one from Becky about what to do with a modest windfall. How should she invest it? I'm getting some extra money — about $10,000 — and have no idea what to do with it. I'm 57 years old, out of debt, and have about $9,000 in my company's 401(k). That's my only savings right now. Also, I bought a house about three months ago. I have no knowledge on how to invest, but do have a couple of people in my life who have some understanding of investing. Do you have any suggestions or could you give me some websites that would help me make this decision? After setting aside $1000 (or $3000, or even $5000), then I'd invest the rest. It doesn't sound like Becky has a Roth IRA, so this might be a good time to start one. It's been a l-o-n-g time since we covered Roth IRAs, so to refresh your memory, these little beauties allow average folks to set aside up to $5,000 of after-tax income per year for retirement. The money grows tax-free, and there are no additional taxes when the investor eventually withdraws the money in retirement. A Roth IRA isn't an investment, though. It's a place to put investments. It's like a bucket that you can fill with stocks or bonds or mutual funds and all sorts of other goodies. I recommend that most investors keep things simple at first. Don't get caught up in the idea that you have to buy all sorts of stuff you don't understand. You don't. Becky actually asked about investing websites. One I refer to again and again is Money 101 from CNN and Money magazine. It's a solid introduction to all sorts of financial topics, including mutual funds and the like. My final piece of advice? Be careful. If something seems too good to be true, it probably is. It's okay to listen to investing advice from other people, but always remember: Nobody cares more about your money than you do. If your nephew tells you to put all of your money in gold, don't just run out and do it. Get a second opinion. Think things through. Take your time. Decide what seems to make the most sense for you. What do you folks think? What should Becky do with her $10,000? Should she invest it all? Put it all in a savings account? Buy a bunch of gold? And what's the best way for her to learn about investing? How did you decide where to invest your retirement savings? There are 79 reader responses to "Ask the Readers: How Do I Get Started with Investing?". As to the Roth IRA, if Becky is eligible for a deduction for contributions to a traditional IRA, I think she’d be a good candidate. At the moment, she has very close to zero tax-deferred savings, so it seems quite likely to me that if/when she retires she’ll be in a lower tax bracket. Because Becky is covered by a retirement plan at work, her eligibility for a deduction for contributing to a traditional IRA depends on her modified adjusted gross income (MAGI). If that amount is less than $56,000 if she’s single ($90,000 if she’s married filing jointly), then she’s eligible for the full $5,000 deduction. Mike Piper doesn’t mention that he’s written a good introductory investment book himself: Investing Made Simple. Another good, brief intro is “The Investment Answer” by Goldie and Murray. Both these books summarize and simplify what you learn from other “passive investing” texts like Bernstein’s Four Pillars and any Bogleheads book. One problem with J.D.’s advice to invest in a savings account is that at current interest rates, your money is guaranteed to lose its purchasing power at 2% per year or more, due to inflation. Park it in a simple savings account for 6 months and study. Pick up a copy of “The Bogleheads Guide to Investing”. Easy to read and very informative. The Bass fishing is picking up here in the South, in case anybody was interested! Sometimes these discussions need to step back and try to see the forest for the trees. Becky is a few short years away from being a senior citizen, and she effectively has no savings whatsoever. I presume from the post that she’s single, but I could be misinterpreting that. Does she have a defined-benefit pension plan at work, or is the $9k in her 401k, plus SS, the sum total of everything she’s due in her years of dotage? How many more years does she plan to work, and is this realistic in her current profession? Is she expecting to receive assistance from any children or other family members? What are her current income and expenses–she just bought a house? Does that mean with a 30-year mortgage that she’ll be paying until she’s 87? A much bigger picture is needed here. Becky’s 57 years old. She doesn’t have didly in retirement savings, or any substantial savings at all. Despite that she just bought a house that we have to assume is the bulk of her assets. Depending on how “new” her new house is she may need a new water heater, roof, referigerator, etc. tomorrow for all we know. But she thinks that $10K is plenty for investing? I hope she has a high income, because I’m not seeing an awful lot of upside here. Low risk investments aren’t paying much, higher risk investments are volitile and will likely cause her plenty of panic and worry. She’s at the stage where a few percentage points of interest are of less value than just finding ways of saving money and putting that money away. Because of her age and unknowns, I don’t agree with JD that she has anything to “invest”. So my advice to her is keep the full $10K as her emergency fund now and use cash flow to build other savings/investing/retirement money while she learns about investing. As she learns she can invest in some things, lower risk at first. There are plenty of articles out there on how to invest $1000 to $5000, which is something she could look at. But really, she needs to focus on saving versus investing right now. My thoughts exactly! J.D.’s overall mentality is to educate yourself about personal finance one step at a time. Becky needs to track her spending, create a budget, plan for retirement, and READ about investing. Just because you get a windfall of 10k and everyone around you tells you to “invest it” – they’re not always right. The market is crazy volatile right now. Personally, I think the stock market is in for same crazy times over the next few years as Europe and the U.S. shudder through a period of doing their own “personal finance education”. Becky – Drive to the bank and deposit the money in a savings account or money market account (withdraw only in case of emergency). On the way home, stop at the library and pick up a few books that JD has recommended in the past. Do not drive to the bank and open a savings account. Deposit in your checking account. Open an online savings account and transfer from checking to the new online savings. Brick and mortar banks don’t give you any interest. Amen brother. Investing is a word that shouldn’t even be in her vocabulary right now. I think she is in a very scary place. William Bernstein’s book “The Investor’s Manifesto” is an easier read–maybe Becky can start there. Also, look at the Bogleheads guides–sound info. Once you go beyond a basic savings account, there is a lot to learn and a million opportunities to be fleeced. As a fee-only advisor, I constantly see ludicrous portfolios of investments that people have been talked into. Free is good, right? Take a look at all the free stuff on Vanguard’s website–lots of basic info. Vanguard mutual funds are often the best choice for an investor–low cost, and the company is run for the benefit of people who hold the funds, not outside stockholders. Another freebie–www.napfa.org–the organization for fee-only financial planners has a bunch of free webinars and info for the general public that you can use to educate yourself. The only easy thing about investing is LOSING your money–takes no effort at all! But holding on to it and making it grow takes some effort at educating yourself to make good choices. The book I’ve seen referenced EVERYWHERE regarding investing is The Intelligent Investor by Benjamin Graham. I am currently reading through it and am finding it a great resource. I’m honestly surprised it wasn’t on your reading list. I love that book, Tad, and it’s sitting on my bookshelf behind me. It’s way too daunting for a newbie, though. While GRS is re-visiting the basics of investing I would love to learn more about when it is ok to start investing. I am 28, single and have 38,000 in school loan debt and credit card debt ($9000 of that is cc debt). I do not have a car payment, contribute a measly 1% of my income to a 401k and have approximately $2,000 in savings (my emergency fund). I am going to raise my emergency fund to 5000 to cover replacement of my 11 year old car whenever it bites the dust and then I am going to implement a debt snowball to get rid of my debt asap. This whole process may take 5 years or more to complete and I don’t want to lose out on 5 years of earning interest and investing. Is there a specific formula for determining when you should start investing? 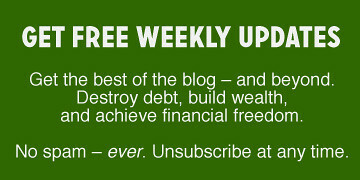 Do you have to be debt free? Do you have to have a certain dollar amount saved? Thanks, I really enjoy this blog! There’s no specific formula. As JD is always touting, do what works for you. In analyzing your situation, your biggest concern right now should be eliminating your credit card debit. The magic of compound interest works for the credit companies too. You may lose out on returns of 5-10% from not investing right now (assuming you leave your money in for 10+ years), but you are currently paying around 15-30% in interest to the credit card companies. I’m assuming your student loans are low interest. The only thing I might consider instead of aggressively paying down the cc debit as fast as possible, is increasing your 401k contribution, if and only if, your employer provides a match. A match is essentially 100% return on investment. Try to max out the match. Increase by $20-50/month if you have to. Once the credit card debit is gone, you could take the amount you were paying on your credit cards and apply part of it to investing and the rest to paying down the student loan. Thanks Emily for the good advice. My employer does not match my 401k contributions so I might look at another option for retirement savings but in the mean time I think your advice is sound to not worry about investing until the debt is gone. I want so badly for my finances to be fixed all at once but I need to focus on one thing at a time. Thanks! Contribute enough in your 401k to get your full employer match. Beyond that, PAY OFF YOUR DEBT! To the question for the day… She needs to keep all of that $10k as others have said. She can’t afford to invest it. Just don’t spend it. EMERGENCY may need to be redefined! $9000 in CC debt is too high. Don’t buy new clothes, don’t eat out, get a cheaper cell phone plan, drop the cable subscription. Thanks Nelson I appreciate the advice but I should clarify that I racked up the majority of that cc debt a couple of years ago when I was unemployed for awhile. I really did not have a choice and only used the card for essentials. After unemployment I got a very low paying job and had no emergency fund so my balance went up a bit more for some emergency needs. I have a much better job now and am finally in a place where I can start aggressively paying down my debt. I agree that 9000 is too much in cc debt but I promise it did not come from frivolous spending. bethany, excellent job with focusing on an emergency fund followed by a debt snowball. As others have suggested max out the 401k if you are receiving an employer match. Aside from the 401k match, my suggestion is to aggressively pay off your student loans and cc debt as fast as you can. In 2006 I was 27ish, and decided I should invest in a roth IRA. I invested $1000. What is that IRA worth today $726. Now that my student loans are paid off, the car is paid off, and thankfully I make more money, I certainly do invest in the stock market (mutual funds, etfs, and bonds), yet for someone my age, I keep a lot of money (perhaps too much) in cash too, and the reason is this: Cash is freedom, the stock market is a game, you should only invest what you feel comfortable losing. Thank you Andrea and congrats on paying off your student loans! I imagine that feels pretty great. I will for sure be paying my debt down as soon as possible. I think I just get anxious thinking about how much I need to save for retirement when all I need to be focusing on now is getting out of debt. Investing is not simple . The current economic situation facing the country and a lot of the world is huge and unprecedented the situation will unfold however it may in the next couple of years . Investments made right now may not be able to be recouped for 20 plus years there is no way of telling what is going to happen but at this point I am leaning on the side of caution. Take the time if you want to learn how to invest to self educate your self the information you need I think is best found in books and not on the finance channels . Consider reading in no particular order how to read a financial report by Tracy Against the gods by peter Bernstein and Influence by Robert Cialdini . You also need to have an understanding of economics a good title to get an idea of what is going on right now from is end game by John Mauldin these books are just a start the more you read on the subject the better your understanding will be it takes time . The other thing I would do in the mean time is paper trade set up an imaginary portfolio on a site like Google finance and treat it like the real thing record transaction costs as you buy and sell and think about how you would feel if you where really up or down in a particular stock . When and if you feel you are comfortable with the process that is the time to set up an account.Best of luck . If you don’t have an emergency fund, do that first. $10k is nothing when you own a home – roof, HVAC, etc. You should not be investing in the market if $10,000 is your only non-retirement savings. Sorry to be blunt. Other than that, maybe invest some money in your career/profession that could allow you to earn more money. At 57, investing it isn’t going to get you too much – compounding wise. If I were Becky, I’d hang on to that $10k as an emergency fund. I’d also take a long, hard look at where my money had gone until this point. Coley noted that a much bigger picture is needed here. I agree, and I believe that Becky needs to focus on it. Perhaps she has zero savings and practically no retirement because of illness, divorce or underemployment. Perhaps her precarious position is not her “fault” per se. But she needs to get a handle on her spending, fast, because as others noted her house may become a money pit. Even routine maintenance/repairs can chew a hole in your pocket. I’d be saying the same thing even if she were renting. If she were to lose her job, how long before she got evicted? A $10k EF would help tide her over until she got more work. That is, if she could get more work. As Liz Weston wrote at MSN Money, some unemployed people in their 50s are actually retired but don’t know it yet. It’s one thing to operate without a safety net when you’re in your early 20s. In your late 50s? Yikes. Incidentally: I speak as a nearly 54-year-old woman, not as some clueless whippersnapper who thinks she can lecture her elders. And I wish you luck. She has to be leaving something out – how could she qualify for a home loan if she only had $7K in savings? Or did she liquidate her assets to buy a home outright? I really hope she’s in much better shape than her short email implies. This whippersnapper would like to add that an emergency fund is not so good if you don’t have the means to replenish it. Wipe it out and then what? Back to zero savings? I know Donna is the queen of extreme cost-cutting, but I’d rather have a side job than take in a lodger. The whole point of my home is to shield me from other people. Shoo! Shoo I said! I don’t like to find strange hairs in my shower.” Ugh, people give me the creeps. It was just one possibility. Personally, I value my privacy and don’t want to share a place. Here’s another suggestion and maybe I’m crazy but ok. Since retirement is coming up for her, maybe (just maybe) rather than invest it, look at using the money to start a business and increase her income? Because compound interest isn’t going to get her a lot until retirement. For a traditional business model, it would need to be something that a) she’s good at, b) requires a low investment, preferably a service of some kind, c) has a good potential customer base. The $10K would go a long way into doing this– maybe pay for some community college courses. My bookkeeper makes sweet cash just plugging numbers into a spreadsheet. She does it on the side of her real estate job. Alternative, Becky could try “muses” the way Tim Ferris suggests. Make a better plastic poncho, test it with google ads, blah blah blah. The whole model is explained in the “The Four hour weekend”. Don’t let the Peter Pan talk (“ferrari, maaaan!”) distract you from the more important information contained in that book. You might come up with the next thighmaster or something (he he, thighmaster). But no, really, consider that option if you’re willing to be experimental. If it could make you $300/$400 month it would be a much better return than a bank. Ha ha ha yes. Perhaps my mind jumped to “weekend” before finishing the title phrase because of all the time he spends discussing tango dancing, parachute jumping, arctic exploration, go-kart races, etc. etc. (ok, I kid, but yeah, all his thrill-seeking hobbies). These are the most important words in the article, in my assessment. A Random Walk and Four Pillars are both fantastic books. So, yes, be sure to read them. But understand up front that those books both also contain lots of Get RIch Quick mumbo jumbo. Read them with a critical mind. My advice to new investors is to understand that the primary expertise possessed by most referred to as “experts” in this field is an expertise in selling stocks. Stocks are a great asset class. But when you hear someone defending the idea that you can buy stocks without paying attention to price and still do well in the long run (Buy-and-Hold), hang on tight to your wallet! If she has no emergency fund, I agree this is a first consideration. But this woman is severely in need of beefing up her retirement funds. (I’m assuming she has no pension or other retirement income source.) Does her employer have matching for the 401k? If so, I would calculate what contribution percent will net her $10,000 by the end of the year and then use the windfall to cover the reduction in her paycheck. She gets a tax deduction and employer match. If her employer doesn’t have a match for 401k contributions, and she is under the limit for traditional IRA, then that would be my second choice (in order to also get the tax deduction). I’m assuming Becky is a government worker with a guaranteed pension coming to her. I’d max out the Roth, put the rest aside, and max out the Roth again next year too. With a Roth, she’s got complete access to the principle at any time without penalty. I don’t think that’s a good assumption. Government workers *might* have 401(k) plans, but none of those who I know do – they have 403(b) plans, or defined-benefit plans, not 401(k). The older government workers I know have pretty good pensions if they’ve been a government worker for a long time. I thought the 403(b) was the nonprofit version of the 401(k). A Roth doesn’t have to be a speculative investment–it can be something a lot safer. Some people count their Roth contributions as part of their emergency fund since you can take them out without penalty at any age. Until more of the story is revealed, I would max out the Roth IRA and at 57 you can put in $6k. Go low cost fund at Vanguard or someplace similar. Vanguard Wellesley is yielding >3% right now and has been over that for the past beaucoup years. Reinvest dividends and max out every year. I really think we are doing a disservice to Becky. Unfortunately, as noted by the posts above, there are way to many unknowns. It seriously drops the value of this post and input that can be given by the readers. It’s one thing to get advice by your peers and the readers based on experience, which can be quite valuable. Its another thing to give advice on such an incomplete picture. If you were going to an investment advisor, the first thing she should do is profile you and ask a number of clarifying questions around topics such as potential sources of income (pension, expected social security, etc…), current financial picture, how long she will/can work, risk tolerance, willpower on tapping money in savings, future projected expenses, so on and so forth. In this case a follow-up email to Becky asking a few basic questions would have been appropriate and then we could have given advice that is more relevant. Otherwise how can we tell her anything more than put it into a savings account since one can blow through 10k in a year with unexpected house expenses, especially if she is a first time home owner. One other thing that could be critical is her medical situation, which I wouldn’t feel comfortable discussing in an open forum but most people use a pseudonym anyway so it probably doesn’t matter. There are numerous people that have been sick for extensive periods of time and will unfortunately have shorten life expectancies because of it even while still working, this really needs to be taken into account, perhaps not in Becky’s situation but as you get older and watch people die around you, unexpectedly or otherwise, your values around money can change a bit. Wow,this is amazing. I wasn’t expecting to have my question posted here. Thank you all for all this info. To give some more info: First of all I TOTALLY get that I am in a bad situation and I have to make up for really poor choices in the past. Am not kidding myself about that fact. Beyond that..I am in very very good health and by my family genes I won’t be surprise if I live until 100 yrs (no kidding). I purchased my house at an auction (about 30K less than its assessed value) and it is on a vet loan at 4.5%. I do have a roommate to help out with expenses. I am exploring ways to add more income, like a home business. The only definite large purchase I see in my future is eventually another vehicle. I will be getting these books that have been recommended and educating myself. And also will ck out the websites that have been recommended. Thank you again for all of this advise. It is very welcomed. Becky, glad to hear you are in good health. Clearly we now know you have a mortgage and some income via a roommate. There first thing I would do is do a whole house assessment. Meaning that you look at all your appliances, HVAC system, water heater, age of pipes/sewer/septic issues, roof/siding/windows, basement if prone to flooding, basically any part of the house that due to age or wear/tear will be need to replaced in the near future. I am ruling out any desirable upgrades, since they are elective. Get an idea how much they will cost and set aside the money for it or you could just elect to set aside the whole amount if you don’t want to think about all that. If you also are buying a car you will probably set aside the down payment as well unless your trade-in will have significant value. It is good to educate yourself on investments but if I were you I would take a look at your 401k plan first. If it is a good plan with low costs and good choices I would save any cash and increase your contributions (you are contributing to get employer max(if they have)?) to the 401k. If over 50 you can contribute 22k a year tax free to your 401k. Unless you have a huge pension you will probably be in the lowest tax bracket once you go to withdraw. At the very least make sure you are getting any match if any before opening a roth ira. Oh, apologies then for what I said somewhere about roommates. I’m not such a terrible misanthrope in person. I’d say research a side business and then use that income to save more and invest, rather than investing the $10K. The $10K is a good cushion to have for lean times and maybe you can use a little bit of that to start your business but certainly not all. I suggest taking a day off work (or find a free evening) to attend an SBA seminar on starting a small business. They are very very useful. They are usually free or have low cost depending on who things are set up in your area (some work in tandem with a college, some work with support from retired executives, etc). A side business doesn’t need to be a huge operation with a lot of investment. I have a cousin who makes a large chunk of change delivering cookies to order. I agree with your recommendations. Get an emergency fund set up. You will be so thankful that you have one. I am always amazed at how often ours is tapped! I would also recommend beginning to learn about investing and not rushing into getting the money invested right away. It is better to wait a couple months and be comfortable with what you are doing than to invest in something you do not understand. Don’t spend it on non-emergencies! There should be other accounts set up for known long-term expenses like home repair, car repair, etc. Becky, here’s a cautionary tale with a happy ending: when my mom was in her mid-50’s, she divorced and in the process lost half of everything: her retirement savings, pension, equity in her home, etc. She spent the next ten years saving almost everything she earned (fortunately she was gainfully employed) and, at age 65, she was able to retire and live a comfortable, but not lavish, life. She is almost 80 now, and still going strong. She would not be financially independent now if she had not spent the last ten years of her working life living way below her means and socking away everything she could into savings. Good luck! P.S. If I were you I’d put that 10k into an ING savings account and think of it as an emergency fund. Being in good health, and with good genes, Becky is probably looking at working til age 70, and then retiring, she has 13 years to prepare for retirement. That isnt alot of time to allow for interest to compound. Working until 70 means she will get a decent amount from SS. So she just needs to supplement that income a little bit. I would put the whole $10K into an emergency fund, and then ramp up the 401(k) savings to the max she can afford. $9K + ($5K * 13 years) compounded at 4%(stay away from high risk stuff at this point) = $101,445.22 at retirement. Combine that with SS and Becky should be fine if she lives a modest lifestyle. Brenton or whoever could speak to that question – can you actually talk me through the math of compounding interesting? In theory, I understand the premise. However, if I would like to do a comparable calculation. What does that look like on paper? For example, $5k at 5% interest compounded over 10 years? How do I do that? 5% increase mean that in 1 year you will have 5/100 of you original amount as interest plus you original amount. (5/100 + 1) * (original amount) which simplifies to: 1.05 * (original amount). 1.05 * (1.05 * (1.05 * (1.05 * (1.05 * (original amount)))))) which can be simplified to (1.05 * 1.05 * 1.05 * 1.05 * 1.05) * (original amount). The mathematical shorthand for that is: (1.05^5) * (original amount). ^ means “to the power of” in excel you would write =Power(1.05, 5). Here is my answer to the headline question. Get started with investing by first SAVING. Emergency fund first, get out of debt *completely* second, save six months’ living expenses (including taxes and insurance) third. Then and only then do you have money “available” for locking away in any kind of long-term investment. The mere fact that you can withdraw Roth contributions penalty-free does not mean you should treat it like a savings account. If you use your Roth contributions to buy *any* kind of variable-yield vehicle – stocks, bonds, or commodities – you run the very real risk of your investments’ value being down when you need it. So don’t put money you may *need* in an account invested in non-cash. It’s perfectly fine to contribute a nominal 1 or 2% to a 401(k) while you get out of debt and save up a safety cushion. It makes no sense to me to maximize retirement-fund contributions when they may earn (annualized) less than the interest you are paying to carry debt. Bluntly: if you owe money, the money you earn is not all yours to spend – or save. Paying off a 6% credit card or student-loan debt is a guaranteed 6% return PLUS it frees up your cash flow. Specific to Becky: I agree with Brenton. Hope it works out well for her. I’d be reluctant to invest ANY of the money right now. Rather, I lean towards JD’s idea to put the money in an emergency fund (unlese Becky already has a fully funded one-year emergency fund). I agree she should have an emergency fund, but she should consider a tax deferred account (IRA)if ineligible a Roth IRA. I think I would dollar cost average into the market over a 6 month period. Thanks for a timely post. I will be looking at the books from the post and in the comments. I’m 44, healthy, just sold a house and have about $100K to invest, have no debt, solid emergency savings and invest 10% in my 403(b) with a 6% match. This isn’t maxed, but it’s what I can afford and continue to save outside of retirement stuff (yeah, I should probably max it out, but a lifetime habit is tough to break). In the long-term I expect to put this into property again, but in the mean-time I just stuck it in a CD at the bank. I have philosophical opposition to investing in stocks through mutual funds, I’m unlikely to pay close enough attention and do research to pick individual stocks, I’m okay with bonds, but I don’t really know *how* to buy them, and I don’t know what else to do with it. I’ll read the books, but I would also welcome ideas from this crowd. Thanks. Why don’t you max your employer plan with part of that $100k? There’s nothing wrong with saving that money for now. Just don’t feel like you can buy new stuff, eat out, etc. Don’t “invest” in property unless in the form of a REIT. You wouldn’t put all your money into one stock — putting all your money into a piece of real estate is an even worse idea. Spread your risk. … and trust me, not only the housing market, but the commercial real estate market, have a LOOOOOONG way to go before they are stable again. The commercial real estate bubble is just getting rolling, frankly. Yes, I agree about property as an “investment.” I meant that when I figure out where I’m going next I’ll end up buying another house or land. I don’t want this money to lose value while I’m dithering about my future, but I don’t want to go into mutual funds, either. CDs are safe and reliable, but their security is reflected in the earnings. I’ll do some reading (oh twist my arm ;-). There’s another option, Linear Girl. Index funds are not really mutual funds. Fees are very low on index funds. You are not paying anyone to manage your investments, you are just buying a share of the entire market, which takes away the need to research individual stocks. I have no problem with CDs. I am just trying to point out an option you may not have considered. Looks like Becky will have to rely on docial security for retirement. I agree with the rest she should build an emergency fund. She doesn’t have enough time to invest for the money to grow much. I hope she has equity and maybe she can do a reverse mortgage, so she can have a comfortable retirement. Objectively speaking, the best strategy for a small investor is to put the same amount into the market each month over a period of time. So you have 10k to invest? I would plow $500 a month into a blue-chip dividend fund or ETF (think DVY) over a couple years to make sure I’m not putting too much money to work at one level. Subjectively speaking, I would wait for Europe to finish imploding before I put any money to work in this market. When I was just out of high school, I thought I was making a good investment with the CD’s I had opened that were making 1%. Then I learned about inflation, and realized that I was actually losing money. That’s when I started researching and learning about other investment vehicles. All that to say, inflation is something that needs to be kept in mind when making investment decisions. Also, keep in mind that inflation is probably higher than the 3% that the government is reporting now. They have made several changes to the way that inflation is calculated over the decades. If inflation was calculated as it was in 1990, it would be about 6%. The method used in 1980 would put our current inflation rate at 10%. There is a lot of talk about learning different types of investment vehicles. I’ve been reading about EFTs and mutual funds, stocks and bonds, but how do I actually divide up my money? In addition to an emergency fund, I have $50,000 to invest. If I put some of it into an international EFT, and more into a domestic EFT like the S&P 500, what do I do with the rest of the money? I’d love some input! Have you considered a fee-only financial planner? A couple of hundred dollars is a worthwhile investment with the ultimate goal of being a good steward with your hard earned cash. Okay, I am a fee only financial planner, so I’ll reply.Rick Ferri writes a lot of books on what’s known as “asset allocation” which is what you’re asking about. His book “All About Asset Allocation” is probably the easiest guide for the lay person, but it isn’t for the complete novice. Any book by William Bernstein will also discuss this, with a bit less technical jargon. Basically, you figure out what “asset classes” you want to invest in e.g. stocks vs. bonds; then large-mid-small cap stocks, international (developed vs emerging market), maybe REITS, different types of bonds, etc. There’s a lot of research on how to mix the ingredients, but the biggest benefit is really in diversifying in the first place. What you’re aiming for is not all your assets go up or down at the same time, so you get some balance or evening out–and some will definitely go DOWN–they won’t all be on the upswing at the same time. Yes, a fee only planner can help guide you through. However, with “only” (yes, I do know how hard it is to save that much) you’re going to pay a fair amount for investment advice–altho planning is worthwhile if there are other issues, such as retirement, college funding, insurance planning, estate, etc. With $50,000, I’d advise doing some educating of yourself first, then finding a planner you can hire for an hour or so to ask follow up questions specific to your own aims. For example, if you’re already investing in something through a 401k, your investments outside of it should balance those investments. Also, allocating should take into account what should be purchased in a tax free account vs. held in a taxable account. Read up first, then find someone to answer the rest of your questions. FYI, fee only planners usually charge $175-$325 an hour–and can save you way more than that in mistakes. However, it’s not chump change and the more you know, the more advanced and personalized information they can give you. I started investing when I was a kiddo, I invested the money saved in piggy bank in shares. I was fascinated by the difference between 52 week low and 52 week high. My dad didn’t didn’t preach me at first and obliged my request to buy those shares. Later on he taught me all about stock market and why looking in to just one parameter was a risky decision. Within 5 years the value appreciated by 5 times, making me obsessed about investing and finance. ciao.. I think more bang for the buck could have been gotten out of this post. When people are truly investment novices – they could probably really benefit from some basic definitions asset classes, like bonds, stocks, mutual funds, ETFs, 401ks, TSP (Thrift Savings Plan), 403bs, Roths. Not intricate detailed cumbersome language, but just in plan English. If someone has lived from check to check, come from family that had destructive money habits. The beginning may truly mean the beginning. Early on, I brought and read money magazines – years ago they routinely used terms that were foregin to me. Terms never discussed in my household, my circle of friends, my community. I was not sure what a stock was? When I had some inkling of what it was I did not know where to buy it? I had never saw a bond before a professor brought it to school and passed it around for the class. Plain language is best. What does it mean to buy a percentage of the market? What is the S&P 500? What is the DOW? Why are the numbers so different? What does it mean when those indexes go down? How do you read a financial report? What are the components? A dear family friend did not understand that a website like Sharebuilder existed that you can incrementally invest on your own with $20 or $50 bucks? Trading stocks is not just a rich person’s game anymore? What does it mean to reinvest dividends? I understand that each one us has to take personal responsibility for learning about the world of personal finance. No one should wholly rely on a blog for their information. However, GRS is a dynamic and thriving community. JD is considered a credible resource for a reason, his public persona is humble, objective, reasoned, and logical. There is a dearth of material available that has not been touched on in any substantive way. This material is consistently ignored while other things are addressed redundantly. Now that I’ve made my own shampoo, cut coupons, sold my car, made a healthy cheap soup, when to the thrift store and brought my clothes – what can I do with my savings? There is a better answer than by this or that book. A series may be in order…..
Oh editing feature how I miss and fervently long for thee!?!? This might be a moot point, but am I the only one wondering if Becky should have bought the house? I guess good news is she got in for under appraisal and is on a VA loan. (Thanks Becky, for your service or support of a service person!!) But even though a mortgage-holder accumulates equity, there is so much interest front-loaded that (for a 30-year mortgage) you pay the bank way more than you pay yourself for the first half of the loan. Also, some VA loans allow you to get in with a lower down-payment, exasperating the interest/equity equation. Then there is maintenance and insurance. And her maintenance burden will only grow… I keep wondering if she would be better off renting with a roomie and banking the savings. I know J.D. posted something on renting v. buying not too long ago. I will have to look that up. That aside, I wholeheartedly agree that saving the money for emergencies is a good thing. And I think it is great she has a roommate! Investing I think is the answer here. Although, she doesn’t have much knowledge for investing in paper assets. I would recommend, as the article said to place it in a high-yeild savings account. Money Markets are not a bad choice either. Place the money in a couple different safe accounts as mentioned above, and gain interest. In the mean time, she needs to learn what investments to make, because ultimately I think she is a little to late start saving now. I personally think she will have a better retirement if she takes her time with decisions, keeps it safe, and find great stocks, bonds, and funds to invest into later. Great advice JD. So many people want to get straight in to the “fun” investing and skip the emergency fund. I agree that is the first place to begin and most people need more there then is often recommended by most advisors. 20 to 40% of annual salary seems like a lot of money, but a great starting place depending on how secure employment is. I think (scratch that – most financial experts think) any savings/investment plan should start with easily accessible savings amounting to 3-6 months living expenses. I’d guess Becky would need at least 10K in that emergency fund if she’s a home owner. You guys live in a different world being people that read blogs like this. There are tons of people in their 50s and 60s who don’t have any retirement savings to speak of and are still in debt. She is hardly unique. We are going to have a lot of seniors living very meager lives on pretty much 100% social security soon! Oh, I’m aware of that. Boy, am I aware of it. In fact, a couple of people in that situation are the focus of my next Get Rich Slowly column: credit is shot, ZERO retirement savings, unpaid mortgage, her job’s in jeopardy, he’s in his early 60s — and they still have three in the nest. Ack. Most of the comments regarding Becky’s situation are spot-on. To the suggested reading list, I’d add anything by Ric Edelman. His book “Ordinary People, Extraordinary Wealth” literally changed my life. I listen to podcasts of his weekly radio show and now he’s doing a series on PBS, which is also available on his website. It’s very easy to understand and a great place to begin. These days, I surf GRS and similar websites (ERE, TSD, FD, FG, MMM, etc.) purely for motivation to maintain my frugal lifestyle and avoid the dreaded “lifestyle creep”. Don’t worry about your age, Becky, just dig in and get going. You can do it! Anyone have opinions about iBonds? From my limited research on today’s interest rates for CDs and high yield savings accounts (highest I can find is 2.1%), iBonds seem like a good option. I’m also wondering if they can be put into a ROTH. I’m 25 and have a job that’s allowed me to save ~20K in the past year (my new husband’s got about the same) and we’re renting. I’d like to have a place to put some money where it can earn a little interest, but I don’t trust the stock market right now.